We are a a family run business of Electrical Contractors who carry our domestic, commercial and industrial electrical installations in Rugby, Daventry, Coventry, Leamington Spa, Warwick and all surrounding area’s since 1984. We have a vast amount of experience in all types of Electrical installations such as houses, offices, warehouses, shops, pubs and restaurants. We are City and Guilds Qualified and members of ELECSA as required by Part P Building Regulations. We have grown steadily into a company that has gained an excellent reputation for our work. We estimate 80% of our work comes from personal recommendations from satisfied customers. 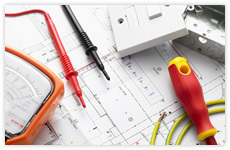 We cover all aspects of electrical work in houses, shops, restaurants, pubs, and warehouses. We take on very small jobs such as installing an extra socket to designing and installing electrics to factories. We provide electrical reports for landlords and homebuyers. We provide FREE ESTIMATES promptly and in cases of an emergency we have someone to your door as soon as possible. We are a small family company which prides itself on it’s friendly service, we are big enough to cope and small enough to care. You’ll find our rates reasonable and our work first class. When you phone you will speak to an electrician that has a wealth of experience in the electrical trade.